The 2013 New York City Public Advocate election was held on November 5, 2013, along with elections for the Mayor, Comptroller, Borough Presidents, and members of the New York City Council. Incumbent Democratic Public Advocate Bill de Blasio, serving his first term, ran for Mayor of New York City rather than seek re-election. The Democratic Party held its primary on September 10, and since no candidate reached 40%, a runoff was held on October 1 between the top two candidates, Councilwoman Letitia James and State Senator Daniel Squadron. James won the runoff to become the Democratic nominee. The Republican Party did not nominate a candidate. In the general election, James faced Green Party nominee James Lane and Conservative nominee Robert Maresca as well as various minor party candidates. James won the general election in a landslide. The runoff between Letitia James and Daniel Squadron was characterized as bitter by most of the media outlets that covered it. No Republican candidate filed to run for the office. 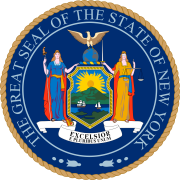 Besides the two main parties, the Conservative, Green, Independence and Working Families parties are qualified New York parties. These parties have automatic ballot access. ^ "Election Dates". Vote.nyc.ny.us. Retrieved November 5, 2013. ^ . "James Defeats Squadron In Democratic Public Advocate Runoff". NY1. Archived from the original on October 3, 2013. Retrieved November 5, 2013. ^ a b "Primary Election Day: Primary Rundown". nyunews.com. ^ "NY/Region: Bitter Tone in Debate Between Public Advocate Rivals". The New York Times. ^ "Letitia James defeats Daniel Squadron in Democratic runoff for public advocate". NY Daily News. ^ "James' Runoff Win Likely To Shape Council Speaker Race". NY1. Archived from the original on October 19, 2013. ^ "Staten Island, New York City Primary Night returns". slive.com. September 11, 2013. ^ "NYC Public Advocate Runoff Results". October 1, 2013. Archived from the original on October 3, 2013. ^ "Working Families Party Backs Brooklyn CM Letitia James For NYC Public Advocate | New York Daily News". Nydailynews.com. May 9, 2013. Retrieved November 5, 2013. ^ "About Alex Merced - AlexMerced.Com - Libertarianism, Economics, and Knowledge". Alexmerced.squarespace.com. February 22, 1999. Archived from the original on November 5, 2013. Retrieved November 5, 2013. ^ "Statement and Return Report for Certification" (PDF). Retrieved January 2, 2014.